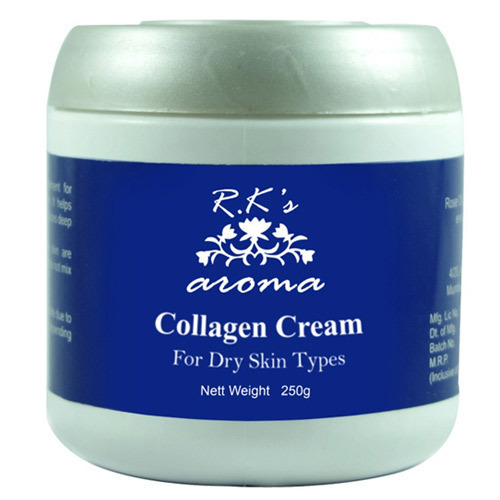 Collagen cream is R.K’s inventory of a marine product, which is an extract of warm water fish. It is a massage cream containing collagen (natural protein). This natural cream moisturizes and replenishes the skin as it contains natural essential oils like lavender, Collagen extracts and Green Tea extracts. Restoring elasticity and tonicity (flexibility) of the skin. Apply all over the face and neck, massage gently till absorbed, carefully avoiding the eyes. Can also be used twice daily (day and night). Lavender oil, Ylang Ylang oil, Chamomile oil, Clary Sage oil, Collagen extracts and Green Tea extracts enriched with vitamins as preservatives. R.K's Aroma Shopis engaged in manufacturing and exporting BodyCareproducts to our clients. These products include Aroma Products,Essential Oils Products,and Magical Aromatherapy Products,Vedic Aromatherapy etc. These products are made as per the international quality standards. They are known for their features like skin friendly, rash less, long shelf life, smooth and clean made under hygienic conditions. Body cares products are very essential and help in maintain our body with natural glow. These products should be used on a regular basis and it revitalizes our skin and exfoliates dead cells from the body. Our products help to removes sweat and dirt from skin and also prevents from excess drying which can lead to premature ageing. Our essential oils specially selected from growers and farmers throughout the world. Each oil is purchased with a certificate of authenticity and a guarantee of quality. Wherever possible we obtain our oils from organic sources free of chemicals and artificial fertilizers. In 1990’s the art of healing through essence was born in Mumbai. This science was known as Aromatherapy, a word known all over the world but yet to make its mark in India….!!!! Mr. Prakash Shivdasani a distinct individual, possessing the qualities of innovation and invention, his ideas have always been different from the common mind.